Get in the holiday spirit with Season’s Greetings from Pixel Film Studios. Season’s Greetings is a jolly holiday theme that comes packed with 4 transitions, 2 lower thirds, a snowy overlay and much more. Season’s Greetings contains a drop zone shaped like christmas themed objects that is fully customizable in Final Cut Pro X. . Users will not want to miss out on Season’s Greetings this year. Season’s Greetings is created exclusively for use in Final Cut Pro X. Embrace the holidays with Season’s Greetings. 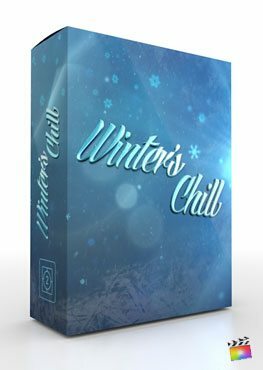 This latest FCPX theme by Pixel Film Studios features an easy-to-use seasonal drop zone with tree, wreath and candy cane formats. Take use of bokeh snow transitions and a snowy overlay to add a feeling of winter to any video and change the layout of the evergreens in the background with a simple generate button. Season’s Greetings’ drop zones can be used with both photo and video media files. Just apply your media to the drop zone in Final Cut Pro X’s inspector window. It’s as easy as double clicking and selecting your media. Create various designs using Season’s Greetings’ easy-to-use color controls. Create desirable looks using simple color wheels and color schemes that realistically reflect with the environment. Changing the background colors will give you an extra level of customization. Season’s Greetings’ is fully customizable in Final Cut Pro X. Controls can be found in the top-right inspector window in FCPX. Utilizing checkboxes, color wheels, sliders, dials, drop-down menus and on-screen controls can help you manipulate Season’s Greetings easily and intuitively. Let Season’s Greetings aid you in creating the video you imagined. Where do I find Season's Greetings? Once the installation is complete, you can find Season's Greetings in the FCPX Generator, Title and Transition libraries.